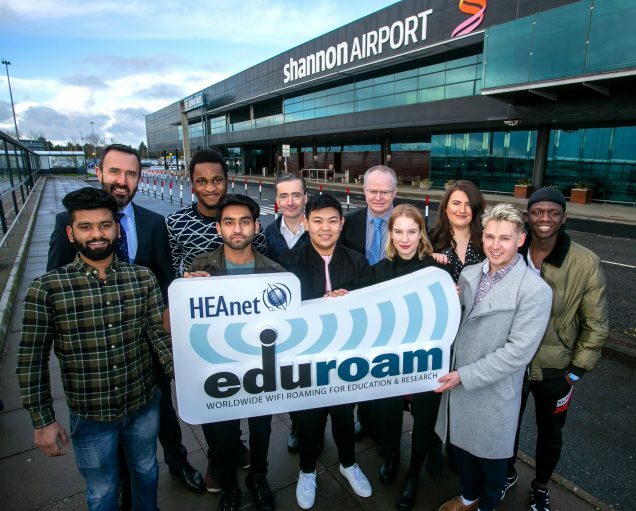 Shannon airport is the first Irish airport to deploy eduroam the secure global wifi roaming service which enables third level students, researchers and staff to stay campus-connected while on the move. eduroam is managed by HEAnet – Ireland’s National Education & Research Network, in collaboration with GÉANT and the global eduroam community. Pictured at Shannon Airport are some of LITs International Students with Shannon Airport, HEAnet and LIT staff. L-R: Shubham Rohilla, India, Andrew Murphy, Managing Director Shannon Airport, Kennedy Akubueze, Nigeria, Muhammad Hasnain, Pakistan, Brian Boyle,Technical Services Director, HEAnet, Ian Chiam, Malaysia, Alan Barry, IT Manager, LIT, Melinda Koji, Hungary, Fiona McKie, International office, LIT, Spencer Sudds, Canada and Ibeabuchi Chimezie Kingsley, Nigeria. Pic Arthur Ellis.